Srinivasa Mangapuram is the small village about 15 kms away from Tirupati. 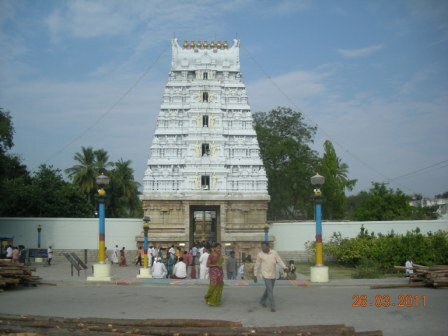 Srinivasa Mangapuram is famous for the temple of Sri Kalyana Venkateshwara Swamy or Prasanna Venkateswara swamy. The Kalyan Venkateswara swamy is a replica of the main deity of Lord Venkateswara at Tirumala. It is believed that individuals who have trouble in getting married at proper age and people who suffer a troubled married life can pray here and get rid off their problems. Kalyana Utsavam to the Lord is performed here every day. Devotees get rid of their troubles by attending this ritual. At the end of ritual the priest ties kankana (yellow thread) to the right hand of the devotee. Legends say that Lord Venkateswara after his marriage with Godess Sri Padmavathi devi stayed here for six months before proceeding to Tirumala hills, on the advice of Agastheeswara Maharshi. As per Hindu customs newly married couples are not supposed to climb hills. The shrine got the name ‘Kalyana Venkateswara Swamy’ temple due to the reason that the lord stayed here immediately after his marriage. Srinivasa Mangapuram is a piece of architectural marvel. The temple hall and its stone carved pillars reflect the excellence of the medieval south India. The stone pillars inside the temple are in great geometry and carved with portraits of Gods, Goddesses and Dancing Women. The structure inside the temple is not exposed to the environmental changes and gives a feeling if the structures were done recently. This ancient ‘sthala’ had dilapidated due to the fury of nature and foreign invasions. The hamlet known as ‘Sithakudam Srinivasapuram’ was donated to Annamacharya in the year 1540. Due to the relentless efforts of his grandson Chinna Thirumalaiyya, the temple was renovated according to the ‘Aagama sastra’ rules and daily pujas and festivals had been conducted since 22nd March, 1540, the stone inscriptions say. In the year 1967, the administration of the temple was taken over by the Thirumala Thirupati devasthanam from the priest Sundararaja Swamy. The new management arranged everything right from the daily pujas to the facilities for the devotees for ‘darshan’ of the Lord. From the year 1981, ‘Nithya kalyana uchavavam’ and ‘Brahmotsavam’ during the months of February and March are being held. How to reach Srinivasa Mangapuram? This great place of mythological importance and architectural excellence is about 15 Kms from Tirupati. There are local transport like autos, buses, and taxis will get you there. There are regular bus services provided by the APSRTC from Tirupati. TTD also runs free buses from the Tirupati Railway station to Srivari mettu, at a frequency of every 2 hours which will go via Srinivasa Mangapuram. There are also private taxis available that take you to the temple and drop you back to your destination.